Are you ready to let go of that something or someone you have been hanging on to for far too long? Are you wanting to reconnect with that wild amazing self? Sol Journeys provides a time and space to open areas in the physical, emotional and spirit bodies that are looking for more peace. We work with the 5 Elements of Chinese medicine and energy medicine. We provide tools and techniques to release the energy you have been holding that no longer serves you. All the while being supported by Gaia and the group to help your system come back into better balance. 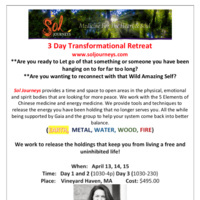 Contact regina.soljourneys@gmail.com for more information.